Give Your Metal Furniture New Life! 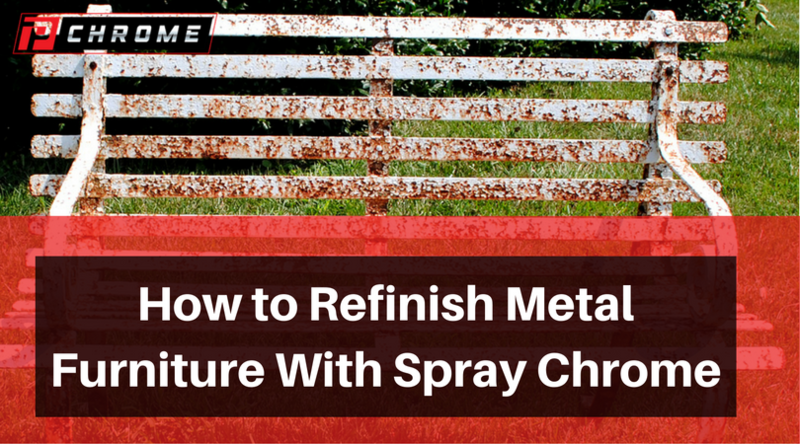 If you have old outdoor metal furniture, you can easily give the pieces a new look with PChrome chrome spray. Even if your furniture is rusted, it can still be salvaged and made to look brand new. You can also choose an old piece from a thrift store and turn it into an interesting conversation piece. Using your wire brush, you will begin by removing loose rust pieces. Scrub large rusted pieces off. You’ll sand it remove the remaining rust after getting the loose pieces off. With your palm sander and the sandpaper, remove the remaining rust. Sand the whole piece of furniture. Using lower-grit sandpaper helps to make certain that all of the rust will be removed. You’ll need to sand curved areas and crevices of your metal furniture. When most of the rust has been removed, start using 150-grit or higher sandpaper. Continue to sand the furniture until it feels and looks smooth. Even if you see a little rust on the surface, it is okay as long as the surface feels smooth. You’ll next need to thoroughly clean your furniture so that it is ready for you to apply your primer and to chrome it. Do this by using the acetone, wiping all surfaces down. Using a rust-resistant high-quality primer, prime the entire piece of furniture. Spray on the primer slowly so that it will be consistent and there won’t be overspray and drips. It is easiest to apply it with a back-and-forth movement following the furniture’s lines. Make certain to apply the primer to the back and underside of the furniture as well since it will be outside. You should apply three light coats of primer and allow each coat to dry between applications. Let it thoroughly dry according to the primer’s drying time on the label. Once it is dry, sand it using very fine sandpaper if it feels coarse. Then, wipe it down to remove all dust. Mix your S, D and R solutions. Each will be mixed in a proportion of one part of solution per 30 milliliters of deionized water. The W solution is made up of one part of the W to four parts of the water. To make your basecoat, you will mix together equal parts of your Permalac 2KA and 2KB with the black 2K reducer at 20 percent of the volume. Spray the base coat, moving from the bottom of the furniture to its top. Use side-to-side sprays that follow the lines of the furniture. This helps to prevent drips and allows a more consistent coverage layer. Let the base coat dry and cure for 24 hours. You will next take your W sensitizing solution and spray it liberally over the furniture’s surface. Immediately follow that application with your D solution, and rinse it off with some deionized water. Repeat the applications and rinse again. Next, you’ll metallize the surface without allowing it to dry before starting. To do this, you’ll take your dual-nozzled sprayer and apply the S and R solutions all over the furniture, again following the lines of the furniture and moving from the bottom of it to the top. Apply until you have the degree of shine that you want. Your topcoat is mixed together in the same manner in which you mixed your base coat but with 20 percent of the clear reducer instead of the black reducer. Spray it on in light passes from the bottom to the top. It will fully cure in about 48 hours. When you are finished, that old, rusty metal furniture will shine with a mirror-like gleam. No one will ever know that it used to look like it belonged in a scrapyard. To refinish your metal furniture, order your PChrome spray-chrome kit today by calling us or ordering it on our website.